Don’t go through Hell trying to satisfy your taste bud’s passion. We’ve already done that, for you. 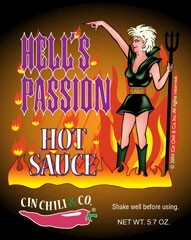 Hell’s Passion…an extreme tasting experience, creating a flavor burning emotion. Contains habanero. USE WITH EXTREME CAUTION: May cause an endorphin overload! Ingredients: various peppers, vinegar, spices, habanero, salt, sugar, dehy.onion & garlic.